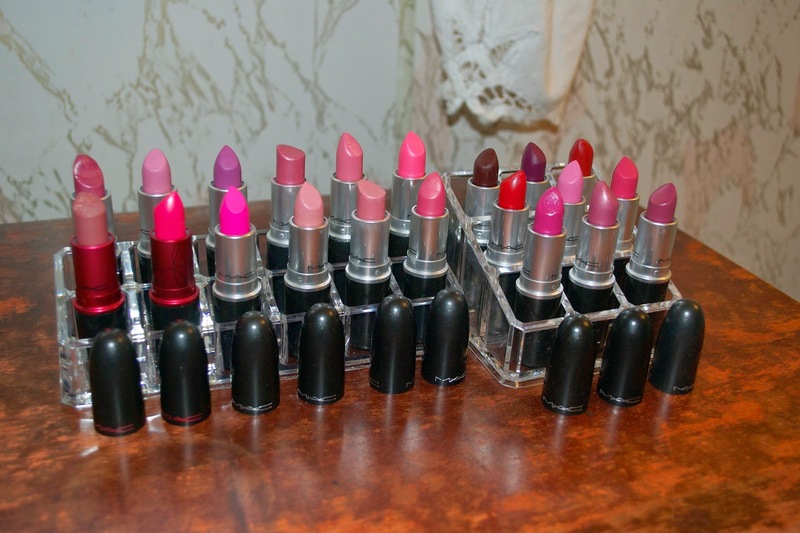 I am a MAC lipstick addict. I just can never have enough! They are amazing quality and come in many different colors and finishes. They apply smoothly on the lips with fabulous staying power and pigmentation. My personal favorites are the satins, lustres, and cremesheens. If you haven't tried MAC lipsticks, I highly suggest you do. I have been growing this collection for about four years. MAC lipsticks are something I truly love collecting and I want to purchase more and more. I don't see this obsession stopping any time soon! 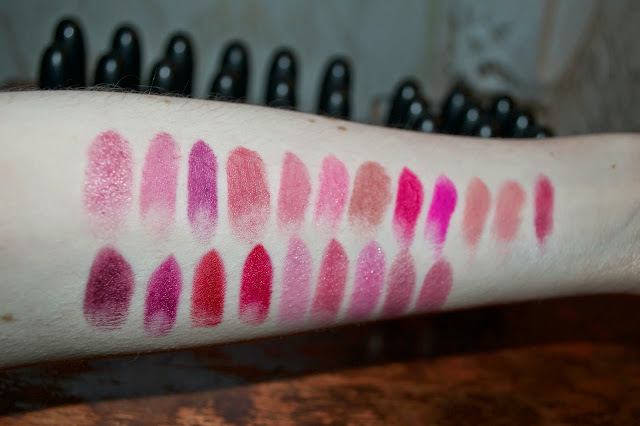 I've swatched all my lipsticks on my arm below, so you can get an idea as to what they look like. Keep in mind, they do look a bit different on the lips and will not appear the same on any one skin tone. Definitely stop by a MAC store or counter to see these beauties for yourself. It's hard for me to pick a favorite, because I love them all, but if I had to choose I would say Milan Mode at the moment. It has just the right amount of shimmer and is a gorgeous plumy fuchsia. The color I think suits everyone is Viva Glam V. It's a rosy pink color with flecks of gold shimmer that is perfect for day or night. A must-have, in my opinion. Are you a MAC addict like myself? What is your favorite shade? Let me know in the comments below. I love mac lipsticks so much as well! they're just so reliable and the range of colours is amazing. My personal favourites are Mocha and Rebel, can't wait to expand my collection. This is a great post. It gives me a little view into the MAC lipstick brand. I have been hesitant on adding it to my beauty collection because I am so connected to my own brands. I may have to try some of the ones you have listed! But wow this collection is impressive. What colours would you recommend for the summer? I've never tried any MAC lipsticks, but I heard that MAC Red is the perfect shade of red! Next time I go lipstick shopping, I'll have to pick it up! 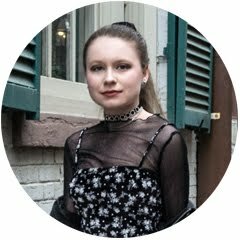 Thanks so much for the honest review! WOW! This collection is amazing. Mine is nothing compared to your's, haha! Loving the various shades of color. I have the heroin mac lipstick and that's all I have from MAC. :) I'll add more to my collection later on.